Lolo Pass, Elevation 5,233 feet, Covered in February Snow. Photo by Jack Eidt. 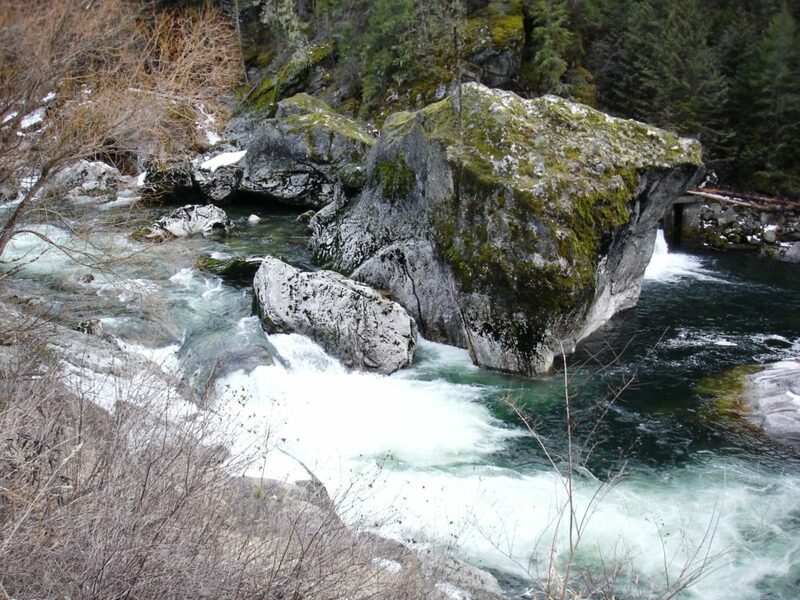 In September of 1805, a Shoshone man, nicknamed “Old Toby” by Lewis and Clark, led the explorers and their Corps on their first difficult, dangerous journey through the Bitterroot Mountains. After 11 days, their horses were near starvation, the men—who resorted to eating three of the colts—not much better. Emerging from the mountains, they made contact with the Nez Perce and procured from them dried fish and roots. 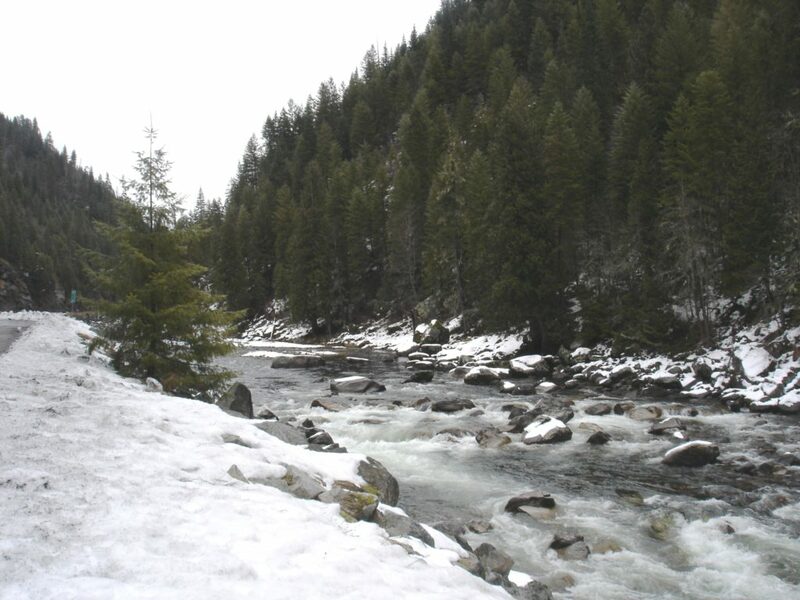 Lochsa River, in Nez Perce means Rough Water. Photo by Jack Eidt. In June of 1806, the Corps, now on their return journey, anxiously waited for the snow to clear so they could cross the Bitterroots a second time. This time, they stayed with a band of Nez Perce, who warned the mountains were still impassable. Too impatient, the expedition started into the mountains on June 15. Although the beginning of summer, they found the snow was still 12 to 15 feet deep. Knowing they could not make the trip alone, Lewis and Clark sent two men back to the Nez Perce to see if they would be willing to guide the Corps through the mountains. After several days, the men returned with three Nez Perce guides, who led them safely through the mountains in just six days. It is clear, without the Nez Perce, the Corps of Discovery most certainly would have perished in the Bitterroots. In early times, the Nez Perce or Nimi’ipuu People lived in scattered villages in the prairies west of the Rocky Mountains in parts of present day Idaho, Montana, Oregon, and Washington. Seasonal migrants, they fished for salmon along the Clearwater and Snake rivers, and harvested quamash or camas plants in mountain meadows. 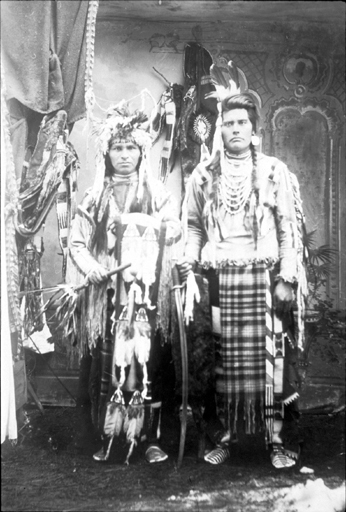 After the introduction of the horse, they crossed the difficult Bitterroot Mountains to present day Montana to hunt bison and antelope with the Flathead (Sa-likh) people. Selway Falls on the Selway River. Photo by Jack Eidt. The Nimi’ipuu had no guns or ammunition. This left them vulnerable to their enemies, who obtained weapons from Canadian traders, and it threatened their ability to hunt. William Clark was the first American to meet any of the tribe. On September 20, 1805, near the western end of the Lolo Trail, he found a small camp at the edge of the camas-digging ground that is now called Weippe Prairie. The explorers were impressed by those whom they met. As they made the remainder of their journey to the Pacific in boats, they entrusted the keeping of their horses to “two brothers and one son of one of the Chiefs.” Upon their return over the Bitterroots, the Nimi’ipuu men assisted them in exchange for what they most lacked: guns. Serving big game hunting and ranching interests and ignoring scientific facts that the re-introduction of wolves has helped ecosystems in the Inter-Mountain West rebound, have now opened up gray wolves to public hunting. Congress’s decision to delist wolves undercuts the Endangered Species Act and jeopardizes all imperiled species. 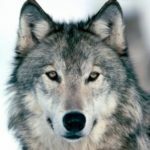 See “Saving the Northern Rocky Mountains Gray Wolf,” from WilderUtopia for background on the politics behind the delisting of the gray wolf in the Rockies as well as a film about their survival in Yellowstone National Park. Idaho has no statewide wolf kill quota but a few limits in certain areas of the state, none of which have been filled, and are so generous that only the quota for the “Southern Mountains” unit might be met. One can hunt wolves there with huge leghold traps, neck snares, neck-breaking Conibear traps, arrows, guns, even snowmobiles. 232 wolves had been shot this season in Idaho. With the opening of wolf trapping season in the North Idaho, including the Bitterroot-Selway Wilderness Area, an additional 86 have been trapped or snared. In most places the Idaho hunt goes until March 31, maximizing the disruption to wolf mating and denning, thus likely reducing the annual recovery in the wolf population. Idaho Rancher and State Senator Jeff Siddoway has advanced a bill that would allow aerial hunting, use of any weapon, including artificial light night scopes on rifles. Live bait also would be permitted to lure wolves to traps. It is still under review in the legislature. Unlike Montana, which has some national parks closed to wolf hunting, Idaho has none except a tiny sliver of Yellowstone Park which is probably wolfless anyway. MISSOULA — A judge has ruled the Montana Department of Transportation must do a more extensive environmental review before allowing oversized loads of oil refinery equipment to use the state’s highways. State District Judge Ray Dayton on Friday upheld a preliminary injunction he issued last summer that blocked Imperial Oil/Exxon Mobil from transporting more than 200 so-called megaloads through Montana as they move from Idaho to the oil sands of Alberta in Canada. Specifically, megaloads move oversized oil extraction and production equipment from their manufacturing facility in South Korea to the Port of Vancouver, Washington, up the Columbia and Snake Rivers to Idaho’s Port of Lewiston, and from there over road through northern Idaho and over the Bitterroots via Route 12 and across Montana to a border crossing at Sweet Grass, Mont. This would transform Route 12, the federally designated Northwest Passage Byway into a permanent industrial corridor would be ludicrous, as it bisects the old growth Bernard Devoto Cedar Grove, crosses the Pacific Coast Disjunct Area, which includes rare plants for Idaho environs, runs alongside streams providing habitat of vital importance to salmon, steelhead, eel, bass and trout fisheries and also the world class whitewater rapids of the Lochsa River. Judge Dayton went an additional step and ruled the agency must review the oil company’s use of alternative routes to haul about 300 smaller, reconfigured modules the company has been shipping since running into problems trying to get legal clearance to move the megaloads.